The contest runs from September 18th at 8am – September 29th at midnight. Winning halls will be announced October 4th! 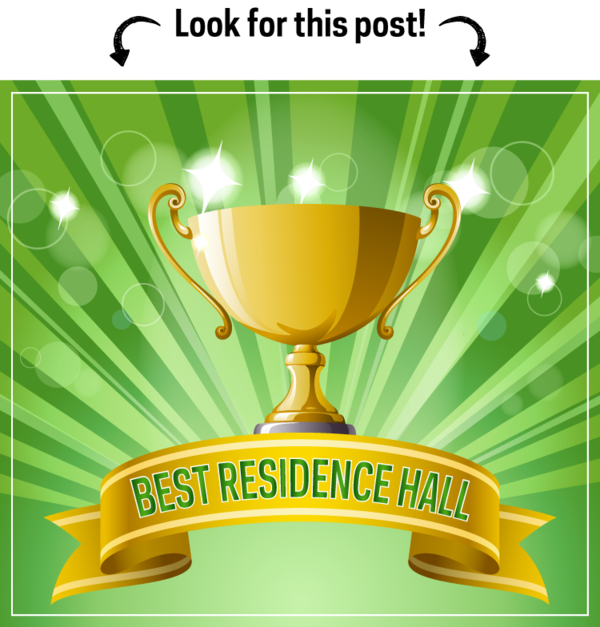 A sign announcing your residence hall as “The Absolute Best Residence Hall *According to Campus Dining” will adorn North and South Dining Halls for the rest of the semester—ultimate bragging rights! A reserved section for your residence hall in North or South Dining Hall for an entire month, complete with your hall’s coat of arms/flag and other cool stuff. A reserved section for your residence hall in North or South Dining Hall for two weeks, complete with your hall’s coat of arms/flag and other cool stuff. +1 PT Follow @NDCampusDining on Instagram. +1 PT Comment on our contest post with the name of your residence hall. 1 PT Add @NDCampusDining on Snapchat. 1 PT Send us a snap with the name of your Residence Hall. 1 PT Visit us on Facebook and ‘like’ our contest post (it’s pinned at the top of our feed). 1 PT Leave a comment on our contest post with the name of your Residence Hall. 1 PT Follow @NDCampusDining on Twitter. 1 PT ’Quote’ our contest tweet by tapping the retweet button and include your Residence Hall name in your comment. *Just make sure your Twitter account is set to ’public’ for this part. Originally published by Cory Hankins at dining.nd.edu on September 11, 2017.